A poor quality screenwash can be a frustration on the road. Having dirt smeared across your windscreen rather than removed effectively is distracting and means you’ll use more screenwash. 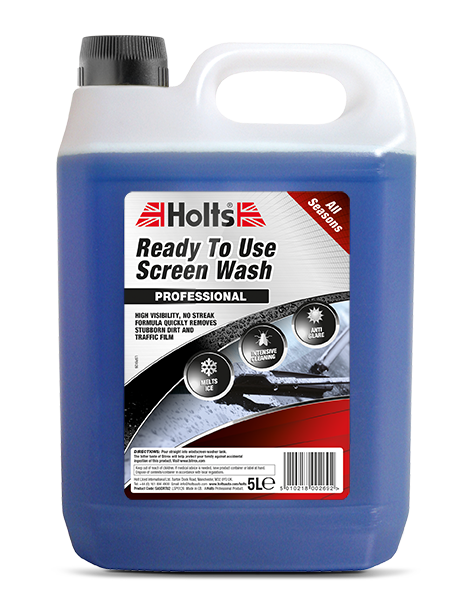 Holts Ready to Use All Seasons Screenwash gives you peace of mind, removing traffic film, insects and dirt quickly and effectively for a smear free finish. Visibility can be reduced all year round – from insects in the summer to ice in the winter. Holts All Seasons Screen Wash melts ice and cleans quickly, so you can use the same convenient product throughout the year no matter what the conditions. The Ready to Use formula means there’s no need for you to dilute it; just pour it in and start benefitting from a cleaner windscreen. As part of our Professional range, this screen wash can be used in all cars in all seasons, so that you can benefit from professional quality every day. Get convenient cleaning today with Holts Ready to Use Screen Wash.